An elongated construction workpiece having a viewable surface and adapted to be cut to a measured length or width at a work site, wherein the workpiece is provided on a viewable surface adjacent one or more of its edges with linear measure markings whereby a desired length or width of the workpiece can be cut utilizing only the markings thereon with no need for a tape measure or the like. - We are looking for (an outright sale, or a license with royalties or another form of partnership). - Patent has not been marketed. - Benefits, to make a difference in the construction world. - Speeds up process of applying product because the need for using a tape measure is elimanated. 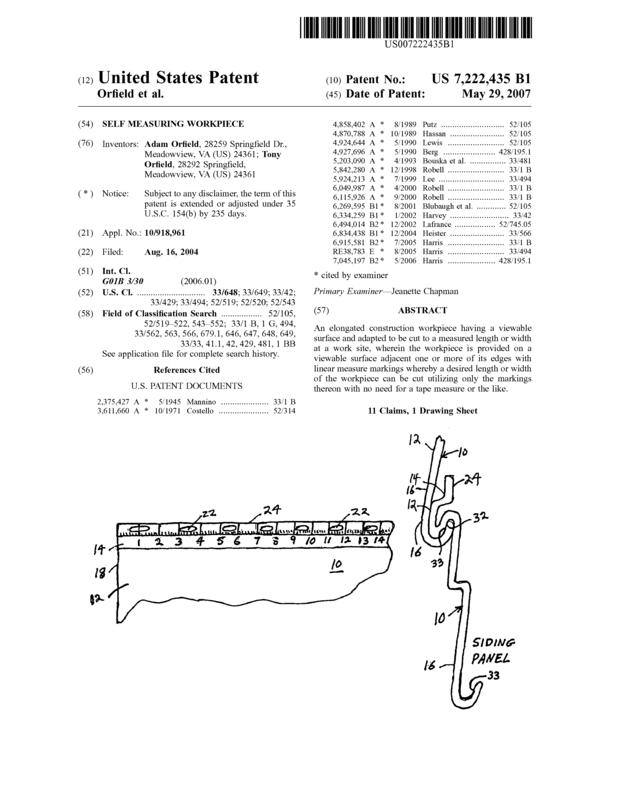 Page created at 2019-04-25 4:45:45, Patent Auction Time.